Straightens flow of liquids or gases in pipelines for accurate metering. Westfall developed the Flow Conditioner Model 3000 in response to a potable water customer for whom measurement accuracy and low headloss were of primary importance. 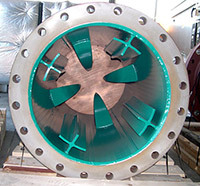 Westfall’s Flow Conditioner is a patented design that eliminates swirl and straightens flow within 8 pipe diameters. It creates the fully developed (+/- .05%) velocity profile necessary for accurate measurement while keeping headloss to a minimum. 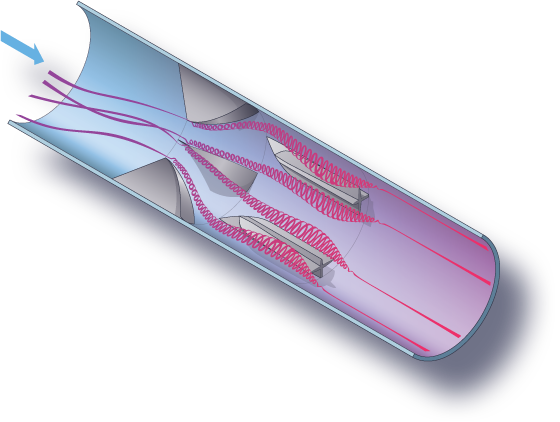 This product features 4 fin-shaped mixing vanes welded equidistantly around the pipe interior at the upstream edge to create gentle blending vortices. Then 4 wing-shaped flattening vanes are welded equidistantly downstream to create a fully developed velocity profile. The flow straightener is particularly effective in situations where highly accurate metering is required in spite of the swirl and turbulence caused by pipe bends or inflow of dissimilar fluids, gases or foams. In regions where issues of water affordability are increasing, accurate measurement is critical. Carbon steel Westfall Model 3000 conditioner with 3M 142 NSF 61 approved fusion bonded epoxy internal coating. Photographed from the downstream side. The leading vanes (in rear of photo) create a vortex that is dampened by the trailing wings offset in the foreground. The result: A fully developed velocity profile (+/- .05%) for both liquids and gases. Inspired by studies of the F18 fighter jet, the leading fins of the 3000 create a vortex which is dampened by the trailing fins. The result: full conditioning in 6 diameters.